There really is no doubt about it, Muscle Fuel Anabolic is one of USN top selling products and has been for many years. Why? It is a quality all in one supplement at a reasonable price that delivers results. USN Muscle Fuel Anabolic (commonly referred to as USN MFA or USN Muscle Fuel Anabolic 4kg) helps add muscle mass to your frame and should be used as a core supplement before all others. For all those ‘hard-gainers’ and honestly for anyone that wants to add bulk, Muscle Fuel Anabolic will do the job! All in one for the reason that it is not just a whey protein powder supplement. There is a hefty dose of carbs alongside an array of additional ingredients which can be bought separately such as creatine, ZMA, beta alanine to name a few. It is worth pointing out that not all supplements like USN’s all in one product are the same, a lot will have different protein to carbohydrate ratios (carbohydrates being cheaper) which will look like a better deal as they may be cheaper. There is no need to worry when buying USN supplements though. USN supplements are some of the best around and are made with the intention of helping you achieve your health goals by using premium grade ingredients. At Supplements2u, we can personally say that USN are one of the best brands as we use them ourselves and have stocked USN since day one! How does Muscle Fuel Anabolic actually help when it comes to building muscles? Calories – At the end of the day calories are the key factor. When it comes to gaining weight in the form of muscle mass you still need to ensure that you are consuming more calories than you are using otherwise nothing will really happen. With Muscle Fuel Anabolic, the typical recommended serving give 585kcals whereas your average protein shake it along 100-200kcals. Carbohydrates – For short ‘carbs’ are an important macronutrient for energy, cell volumisation and also hormone manipulation. Cars as an energy source allows for protein sparing and therefore muscle tissue as the protein can be used solely for muscle tissue repair and growth. Additionally, timing the use of Muscle Fuel Anabolic around training will allow for increased physical performance, alongside manipulating insulin product which can be used to increase the uptake of vital amino acids and so forth from the Muscle Fuel Anabolic supplement. To give you an idea of how the quantity of carbs in Muscle Fuel Anabolic allows for this to happen is that an average protein shake only has a few grams of carbs, whereas MFA has over 80g. Another thing to point out here is that only 7g comes from sugars (as sugars are classed as carbs). With MFA giving you a reasonable kcal quantity by including a dose of carbs this means that it can be used as a meal replacement, although we would suggest not using it to replace a meal, and more to be an addition meal. Creatine – Once of the most research supplements available because it has been proven to work, creatine can help improve workout intensity, recovery and muscle contraction. Creatine should be considered as a ‘must have’ supplement if you want to maximise muscle mass gains. That is why you’ll find it within USN’s Muscle Fuel Anabolic. Note that if you want to further increase your creatine intake, it can be bought separately – USN Creatine Monohydrate or USN Creatine Anabolic. Beta-Alanine – This is another supplement that has certainly proved its worth. It works by acting as a intramuscular pH buffer. When cells become for acidic through activities like anaerobic activity (sprinting, weight training) they become less efficient. This is where the beta alanine comes in to act as a buffer, therefore fatigue can be offset and therefore allow the muscle to work harder and for longer, thus further allowing for muscle breakdown and then growth. Zinc – research shows that it plays a significant role in maintaining normal testosterone levels and the metabolism of fatty acids. There are two advantageous outcomes with regards to lean muscle tissue gain. Magnesium – is useful for protein synthesis. Therefore by having magnesium contained within this all in one supplement, ensures that you will not be lacking this mineral if not consumed with other foods. B Vitamins – USN MFA is fortified with B6 and B12. These help with normal metabolism of protein and glycogen and supporting immune function. HMB – is thought to supress the rate of protein degradation, therefore potentially useful if you are taking Muscle Fuel Anabolic to build muscle mass. Vitamin E and Riboflavin – these have been added to help the body from oxidative stress and therefore protecting the body from muscle breakdown. Pantothenic Acid – During heavy training at the gym, an ingredient that can help with tiredness is helpful, therefore USN have included this within Muscle Fuel Anabolic. 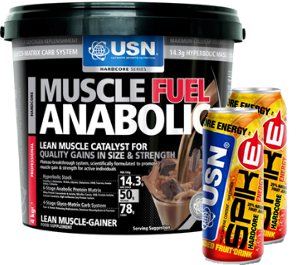 Check out our product details page of USN Muscle Fuel Anabolic and place an order today!